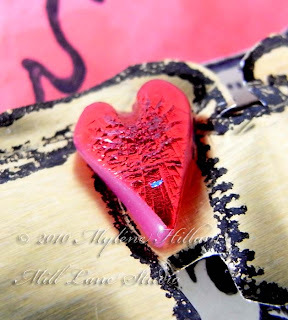 Today I have a mini Friendly Plastic tutorial to share with you..... How to create little hearts to embellish your work - a technique inspired by Liz Welch's flower technique. Liz uses a hot water bath to soften her Friendly Plastic but for this spin off you could just as easily use any of the other Friendly Plastic heating methods. I just happen to use a heat gun as this is what I use to demo this at shows. Cut a small triangle of Friendly Plastic - about 5mm wide by about 8mm long. 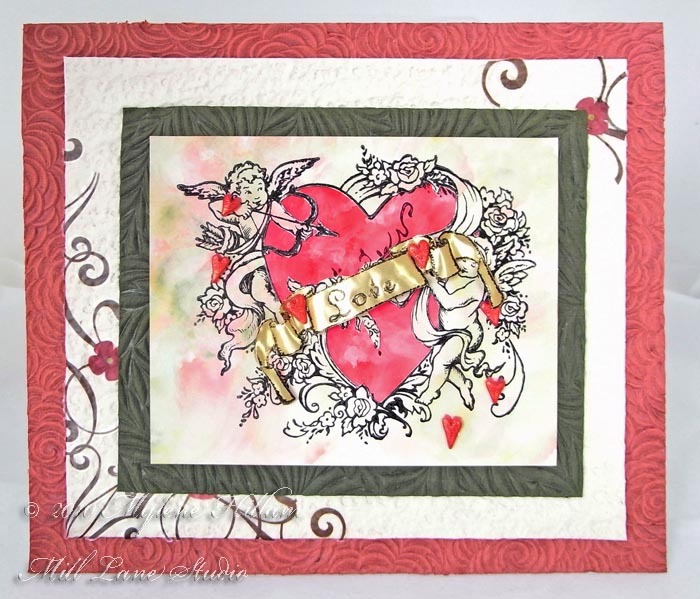 Trim away the two top corners using really strong scissors like Tim Holtz Tonic scissors. 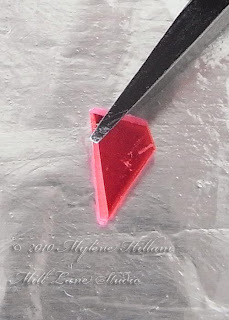 Place the triangle on a sheet of aluminium foil which has been brushed lightly with cooking oil. 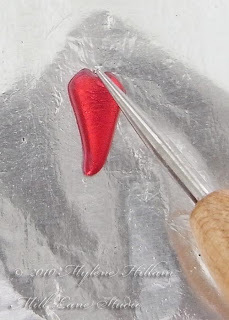 Heat with the heat gun until soft - you'll notice the surface loses its shine and the edges will become rounded. Dip a metal stylus in cooking oil and draw it down through the Friendly Plastic from the top to create the indentation of the heart. 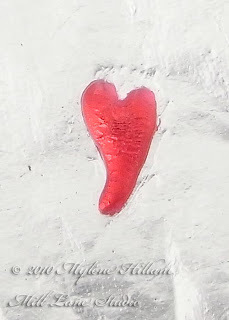 You can play around with the shape a bit whilst it's still warm and curve the bottom of the heart if you like. And there you have it..... so easy! 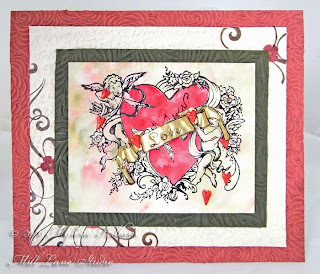 These sweet little hearts make lovely accents on this card and leave the recipient in no doubt as to how you feel about them..... .....And you might have seen this piece in AMACO's Friendly Plastic challenge last year. 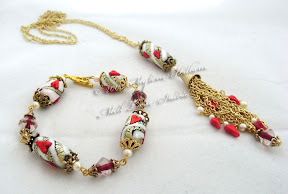 This is the same technique I used to make the hearts that dangle from the chains and decorate the beads on this Valentines jewellery ensemble. 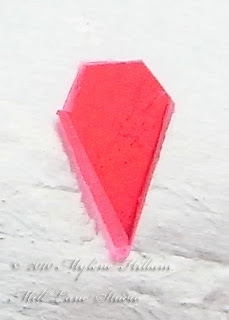 With this very simple idea you can make flowers like Liz's, or butterflies like the ones in this post. 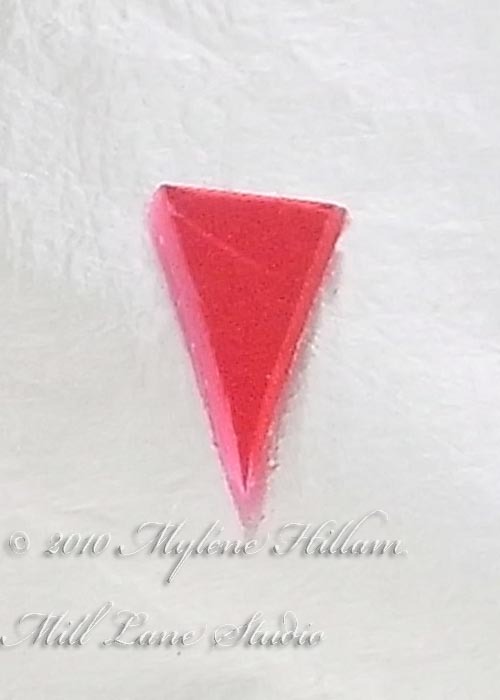 Why not play around with the technique and see what other simple shapes you can make. I love your dinky little heart Mylene, I am really happy to be able to inspre you when you give the rest of us so much inspiration. Thanks Liz. I love how our diverse styles allow us to have such different takes on the same technique.